Atlantik Ball 2015 - Atlantik-Brücke e.V. 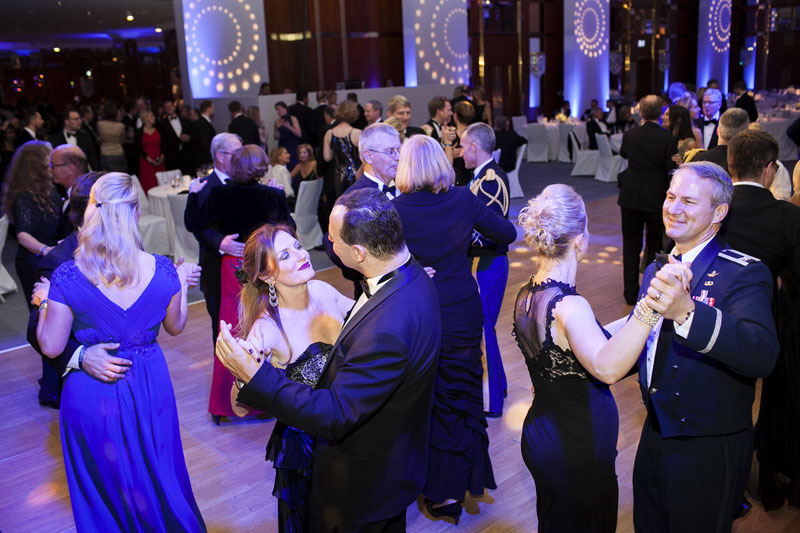 On November 20, the Atlantik-Brücke celebrated the transatlantic partnership with an Atlantik Ball. In her speech, Federal Minister of Defense Dr. Ursula von der Leyen, patron of the ball, reminded the guests of the Paris attacks of the previous Friday. She emphasized that the West will not let anyone take away its culture, its values and its way of life . Admiral Mark Ferguson, Commander of the U.S. Naval Forces Europe, the U.S. Naval Forces Africa and the Allied Joint Force Command Naples highlighted the unique and close bond between Germany and the United States. The 500 guests of the ball danced the night away to live music by the Glenn Miller Orchestra and tunes by DJ Noah Becker. John Goldsby has held the position of solo bassist with the Grammy Award-winning big band of Westdeutscher Rundfunk in Cologne since 1994. Before that, he lived and worked in New York City, being deeply rooted in the big apple jazz scene. Uli Kempendorff is a saxophonist and clarinetist from Berlin and can be heard on many music albums and on numerous radio broadcasts. Belgian jazz guitarist Jeanfrançois Prins has spent most of his adult life as a professional musician and has collaborated with many of today‘s jazz giants. Together, the John Goldsby Trio performs a unique medley of classical music and jazz. The Glenn Miller Orchestra is a swing / jazz big band formed by Glenn Miller in 1938, which advanced to one of the most celebrated and renowned big bands of the swing era. In their typical sound, the clarinet replaces the first trumpet part and is accompanied by the second tenor saxophone, two alto saxophones and the first tenor saxophone. This unusual arrangement helped Glenn Miller to develop his own unique sound and style. After Miller’s death, the orchestra successfully continued its‘ performances. The musical legacy of the orchestra is managed by Glenn Miller Productions Inc. In 1990, David Mackay, president of the orchestra, assigned Wil Salden to direct the Glenn Miller Orchestra in Europe. The Orchestra of the Federal Armed Forces is a brass ensemble led by First Sergeant Markus Hartung. This formation is a classical brass quintet with an additional percussionist. The six musicians are members of the “Bundeswehr Stabsmusikkorps”, which is used for the protocolary service of honor of the Federal Government and serves as the musical flagship of Germany. The instrumentalists are: trumpet – Sergeant Markus Hartung, trumpet – Sergeant Dirk Flügge, french horn – Sergeant Sebastian Grüner, trombone – Sergeant Oliver Schneider, tuba – Sergeant Peter Schmieder, and percussion – Sergeant Ingo Schiwek. Noah Becker, the oldest son of tennis legend Boris Becker and actress Barbara Becker, has gained popularity in the last few years with his fashion line Fancy, before becoming known for his music. He has enjoyed success behind the turntables as a professional DJ since 2012. During the last couple of summers, he has made waves in Ibiza‘s clubbing scene, among others at Ushuaia and Blue Marlin. He lives in Berlin, London and Miami.